The Central Highlands joined towns and regions across the nation in welcoming its newest Australian citizens as part of Australia Day 2019 celebrations. 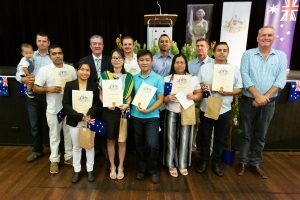 Ten new citizens from nine countries chose to officially become Australian citizens at a citizenship ceremony hosted by Central Highlands Regional Council in Emerald. Mayor Kerry Hayes said Australia Day was a significant day to reflect on the privilege of Australian citizenship and what it means to be Australian. ‘Australia Day was a great opportunity for us to give a warm welcome to our newest citizens and acknowledge the importance of what it means to become a member of the Australian community,’ he said. Mayor Hayes said citizenship is the common bond uniting all Australians, whether you are an Australian by birth or by choice. Thousands of Australians affirmed their citizenship, bringing communities together in regional and metropolitan Australia. “I congratulate those new Australian citizens on making their commitment to Australia and thank everyone that came along to the celebration to make it special,’ he said.